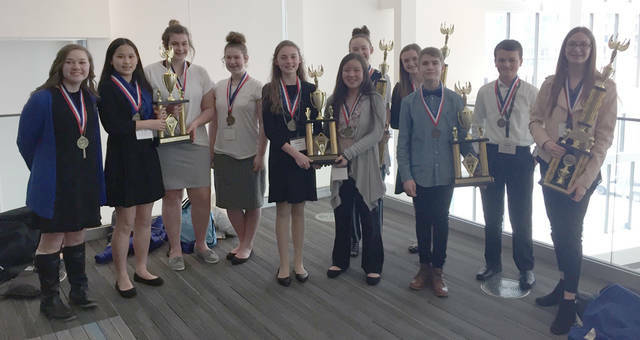 Franklin Monroe Middle School-MVCTC students traveled to Columbus to participate in Business Professionals of America Middle Level State Competitive Events. Pictured are (front row, l-r) Kalynn Huecker, Sherry Dong, Paige Luchini, Peyton Estes, Keihl Johnson, Emma Miller, Ty Furlong, Quinter Garber, Savannah Crist, (back row, l-r) Elli Earwood and Joanie Hall. COLUMBUS – Franklin Monroe Middle School-MVCTC students traveled to Columbus on March 14 to participate in Business Professionals of America Middle Level state competitive events. Joanie Hall placed first in Financial Literacy, Savannah Crist placed second in Spreadsheet Applications, Elli Earwood placed first in Extemporaneous Speech, Keihl Johnson and Emma Miller placed third in Administrative Support Team, Ty Furlong and Quinter Garber placed third in Introduction to Video Production and the Presentation Management Team of Sherry Dong, Peyton Estes, Kalynn Huecker and Paige Luchini placed third. BPA is the premier career and technical student organization for students pursuing careers in business management, office administration, information technology and other related career fields. BPA has 45,000 members in more than 1,800 chapters in 25 states and Puerto Rico. BPA is a co-curricular organization that supports business and information technology educators by offering co-curricular exercises based on national standards. As a co-curricular activity, Business Professionals of America has the ability to enhance student participation in professional, civic, service and social endeavors. Business Professionals of America members participate in these activities to accomplish its goals of self-improvement, leadership development, professionalism, community service, career development, public relations, student cooperation and safety and health.